Hotel Review: The family-friendly Novotel Grenoble Nord Voreppe offers cheap deals in a comfortable hotel with swimming pool for families and travelers to Grenoble, Chartreuse, and the French Alps. The Novotel Grenoble Nord Voreppe is a typical Novotel hotel. The hotel is modern, if a bit characterless, but offer great value and comfortable accommodation for travelers and families of up to four. As the hotel aims mostly at business travelers, very cheap deals are available over weekends and during holiday periods including most of summer. A large garden and outdoor swimming pool are added bonuses. The Novotel Grenoble Nord is typical of the Novotel chain – a long, three-story rectangular building houses the bedrooms while reception and the restaurant are in the adjacent low building. This three-star hotel is modern with comfortable rooms. The Novotel hotels in France are great bargains for families. Two children up to 16 can stay for free and in reasonable comfort with their parents in the same room. In addition, children enjoy breakfast for free, which makes the breakfast a great deal when traveling with big eaters. Novotel hotels generally aim at the business traveler, which is clearly the case at the Novotel Grenoble Nord Voreppe. However, this allow for great deals for families and leisure travelers over weekends and during summer months. During summer 2009, breakfast could be had for €1 per room for guests booking a few days ahead and staying three nights – not a bad deal for four eaters. During mid-week in early August, most other guests seemed to have been families visiting Grenoble and the Chartreuse Mountains or families en route from northern Europe to the Mediterranean. Many families were Dutch, which is often a good indicator that great deals are to be had. The bedrooms in the Novotel Grenoble Nord Voreppe still feature the furnishings one update older than the present, sleek new-look of the latest Novotel hotels. However, furnishings are still in good condition and the color scheme as intended not offensive. The bedroom walls sport artwork of the presumable not too exclusive Accor Collection, which led my eight-year old to remark that she loved a hotel room where children are allowed to provide the decorations. The rooms have a large double bed as well as two single beds that form the base of a coach when not in use. A small fridge as well as a kettle helps for self-catering small meals and snacks. The bathrooms seem to have had the latest Novotel update with modern fittings and good lightening. As usual, Novotel is not stingy with either towels or soaps providing ample for a family of four. The toilet is in a separate room, which irritatingly does not have its own sink for hand washing. The air conditioning was reasonably quiet and worked well despite outside temperatures of well over 30°C – having a room facing east certainly helps. 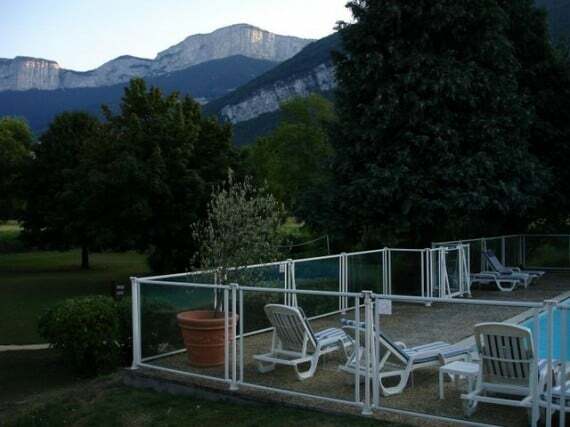 It is worth asking for a room facing the Chartreuse Mountains – not only for the views of the mountains and in summer the maize / corn fields but also to cut out any noise that may come from the swimming pool and restaurant terrace at the western side of the hotel. The Autoroute is to the west of the hotel but even in the hotel garden very little road noise could be heard. Room lightening is OK for reading in most parts while the curtains successfully keep the room dark during the day. Additionally, the Chartreuse Mountains delays the arrival of sunrise somewhat. The restaurant is typical Novotel with modern furnishings and modern cuisine. Prices are reasonable and although the menu is not too inspiring, it is a reasonable option when not feeling like heading out for dinner. Special child menus are available. The breakfast buffet is a decent spread of hot and cold dishes. A free Mac is available in the reception for internet access but it is on a first come first served basis. Also the privacy filter on Novotel computers are rather strict preventing the use of many web sites including tourist information offices that overdid it with the flash and other graphic software. Further wifi access is charged for at fairly reasonable rates in packages that can be used through Orange in all Accor hotels in France.. The Novotel Grenoble Nord is at Voreppe, 12 km to the north of Grenoble. The hotel is very close to the highway Autoroute 48 towards Lyon / Valence, which ads convenience but surprisingly little road noise. When traveling from downtown Grenoble, the Novotel is just before the toll gate at exit13 of Autoroute A48 heading for Lyon or Valence. The drive is very fast even in rush hour. When coming from the north, use exit 12 just after the toll gate. This location is also convenient when traveling by car from Grenoble Airport (GNB). Alternatively, it is possible to drive to Grenoble along minor roads and through the suburbs – from the hotel, simply drive towards the Chartreuse Mountains and turn right and continue all the way to Grenoble. A large Carrefour supermarket is a few minutes’ drive along this route. Ample free parking is available at the Novotel Grenoble Nord, which is just as well as a car is basically essential to get here. CCTV cameras guard the parking lot and the gate is locked at night. Room rates are typically in the €80 to €100 bracket with better deals during quiet periods available especially for early reservations and guests staying for several days. The Novotel Grenoble in downtown Grenoble is usually more expensive and without a swimming pool. The Novotel Grenoble Nord Voreppe is a great hotel for families and leisure travelers with their own car. The location is quiet and convenient for trips to Grenoble, into the lovely Chartreuse Mountains, as well as the Vercors Mountains. It is also a great overnight stop when on longer journeys. See also what TripAdvisor users have to say about the Novotel Grenoble Nord Voreppe hotel.